Adventure out into the American west, and its food varies along with its dramatic geography. From the cold Pacific waters that provide coastal states with world-class seafood, to the ranching resources of the Rockies, to SoCal’s never-ending supply of avocado trees (and avocado toast! ), there’s plenty of culinary tradition and ingredients to explore. But chefs and restaurants across the region -- Portland food trucks very much included -- are taking a hard look at classic dishes and seeing how they can reinvent the wheel. 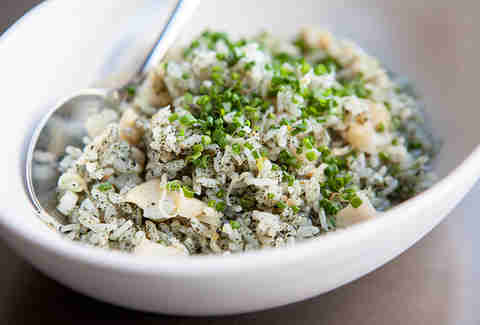 Three words, people: Geoduck fried rice. Here are the region’s most inventive dishes and where you can feast on them. If anywhere was going to turn the classic American burger on its head, it would be LA. Fusion is the city’s primary cuisine, and in general, California is quietly king of the great American cheeseburger. With burger greats like In-N-Out, Father’s Office, Apple Pan, and yep, even McDonald's all born here, you shouldn’t need much convincing that California knows its way around a solid burger. And while breakfast has often visited burger country with bacon and eggs, it’s not often that a burger invades breakfast. 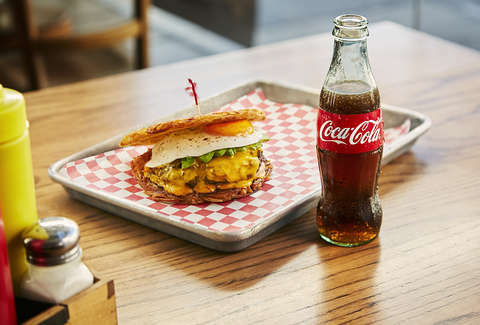 A hash brown crispy enough to act as the bun is the first change you’ll notice, but it’s the hamburger filling in for a sausage patty and spicy mayo that that really catapult the egg and cheese from gourmet breakfast sandwich to perfect brunch item. Connecting that gulf? Avocado. This is LA after all. As a city that people from more than 140 different countries call home, LA represents some of the tastiest multi-ethnic food in the entire country. Nobody does fusion as well -- or as often -- as this city. 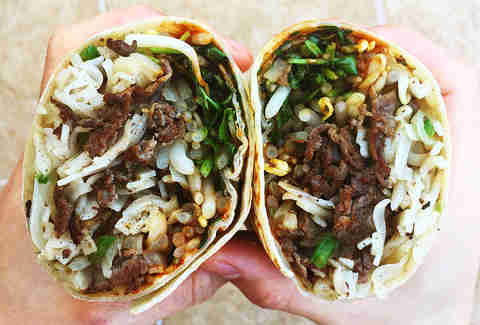 Vietnamese and Mexican cuisine are both top-notch here -- especially bowls of pho and the already-fused California burrito. So when Chef Erwin Tjahyad of Asian-Mexican hot spot Komodo took traditional pho mixings, like tender ribeye meat, vermicelli noodles, grilled onion, bean sprouts, hoisin sauce, and ginger, he nixed the broth for a burrito complete with jalapeños, cilantro, and Sriracha. The result was a match made in fusion heaven… which might as well be a second nickname for The City of Angels. “If potatoes had been picked as Idaho’s iconic food for the zillionth time, we might have gotten *@#!ing testy, right?” wrote Idaho Statesman columnist Michael Deeds after finger steaks were picked by Flavored Nation as Idaho’s iconic state food last year. Idahoans are apparently tired of being known for the potato, but what exactly are finger steaks? They are delicious, tender fried beef tips that look like french fries but are way better -- that’s what. Now, imagine these fried beef tips, dredged in a mix of garlic, spices, and flour, and then substitute beef with wild game. At GW Hunters, look no further than the appetizer section to find this classic Idaho dish reinvented with a choice of fried elk tenderloin or bison strips. Served up with a side of honey dijon, it just barely tames those wild flavors for your civilized palate to admire. When immigrants arrived in Butte, MT during the mining boom of the late 19th century, the classic Cornish pasty (rhymes with “nasty”) found its way into the hearts and bellies of Montanans -- usually root veggies and cheap beef. Now a century later, chefs like Carole Sullivan are taking the regional dish way beyond its former humble beginnings. Using a Kansas recipe for bierocks as her starting point, Sullivan swapped beef for bison and cabbage for kale to escalate the values of the flavor equation in her famous Bison Rocks. 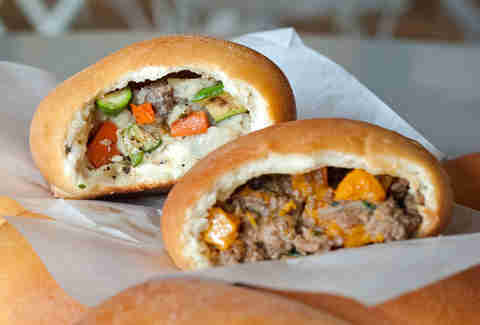 The house-made bun is stuffed with meat, squash, and Jarlsberg cheese to present Montana with a softer meat pocket beyond the ubiquitous pasty. Originated by Native Americans in the Pacific Northwest, cooking wild salmon on top a smoky cedar plank is about as Washington as it gets. But now, regional chefs are building upon the flavors and portion sizes of this classic Washington staple in small but mighty ways. 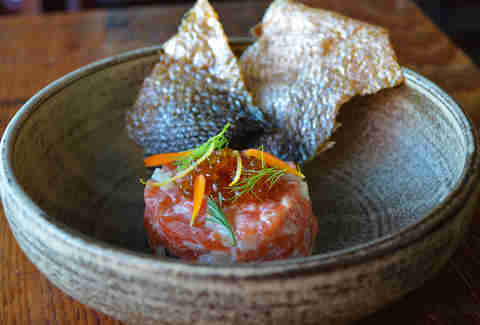 At French bistro Le Coin, a newcomer on the food scene in Seattle, you won’t find beef or tuna tartare on the menu, but a salmon tartare with cucumber and salmon skin cracklings on top of a sea wolf baguette as a playful nod to the beloved PNW fish. But the really transformative element here isn’t the protein. It’s the roe emulsion acting as aioli in lieu of mayo. Fish eggs for chicken eggs? Never has tartare been so meant for sealubbers. 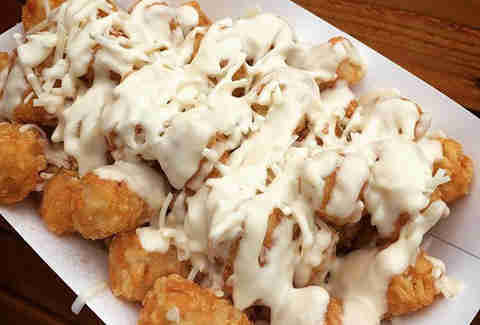 Ore-Ida’s tater tots gave a nation of kids our only reason to get excited for school lunch growing up. On a serious hunch in 1953, the Oregon-and-Idaho-based company took bite-sized potato scraps, seasonings, and deep fried all this goodness together. But why does this nostalgic side dish need to stay a side? That’s what Portland food truck The Dog House Truck wondered, so they made the tot an an entire meal. The Dog House Truck’s Tot Bowls take fantastic toppings, like pineapple, fried egg, and house-made Korean chili sauce, and layers them on top a base of one pound of crispy tater tots. And sure, for $2 you can substitute for sweet potato tots, but the OG tot is the OR-iginal for a reason. Oregon State University was cool enough to invent a local variant of blackberry back in the 1900s, and since then, the state’s gone wild for its sweet, tangy flavor. After utilizing marionberries as a base for just about everything else (jam, beer, ice cream -- you name it, they did it) the berry was bound to hit its culinary ceiling eventually, right? Nope. It just expanded into wilder combinations. After colonizing every pie and jelly it could, the marionberry set its sights on savory dishes. At Bari restaurant, the beloved berry pairs with the rich dark meat of duck, for a sweet veneer atop a deep flavor. Duck breast glazed with marionberry and duck fat sauce is an intricate taste of berry heaven on a plate. You can thank SF in part for popularizing Peking duck in America -- a Chinese legacy dating all the way back to the 15th century. Although the dish didn’t sweep the nation till Nixon’s visit to China, delicious détente had long been a thing in San Francisco (despite its Chinatown leaning pretty much Cantonese), where Peking ducks were imported to make... well, Peking duck as early as 1901. But the city's long history with the boat-like birds takes on a deconstructed twist at The Alembic. 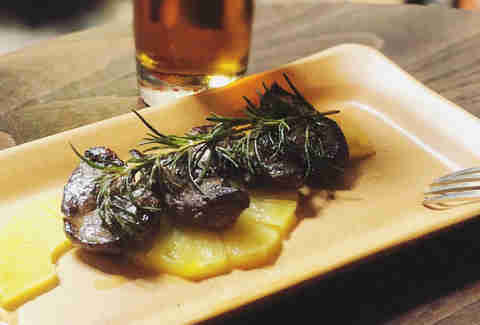 Executive chef Rachel Aronow goes literally straight for the heart with jerk-spiced duck hearts with a side of pickled pineapples. By foregoing the Peking preparation focused on smoky skin and muscle, she’s steered the floating fowl to an offal new frontier. Now that’s getting the most out of your Muscovy. The crown jewel of the PNW happens to be the world’s largest burrowing clam. Pronounced “gooey duck,” this massive mollusk lives in the Puget Sound along the northwestern coast of Washington and has US chefs paying out anywhere from $20-$30 a pound for its sweet, meaty goodness. Sure, you can try it in sushi restaurants as sashimi, but Seattle’s critically acclaimed Joule is going where no one else has gone with geoduck before. Headed by Rachel Yang and Seif Chirchi, the contemporary Korean steakhouse goes bold with the mollusk in a geoduck fried rice served with seaweed and pork rind. It makes sense, when you think about how well crab and shrimp’s brininess pairs with fried rice, but geoduck imparts a sweetness both lack. Native to the northwest rockies, you can’t just grow huckleberries in your backyard. The prized fruit of Montana is often difficult to hunt for in areas like the mountains and forests, so their scarcity is seriously part of their allure. Finding giant clusters of them? Even harder. 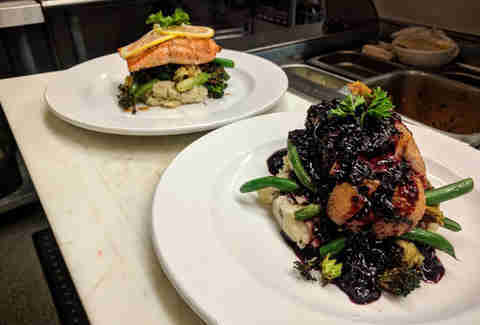 So moving away from a basic jam, pie, or tart to something like the BBQ glaze that Lolo Creek Steakhouse is slathering on tender cuts of meat is that much more adventurous. Order up a pair of huckleberry hog “wings” (pork tenders on the bone) and prepare for the perfect marriage of sweet, tangy, and savory.